Andrew Lincoln might be gone from The Walking Dead, but his character sure went out with a bang. Previously, news of the actor's impending exit had been made public, with every fan knowing Season 9 would be Lincoln's last. As promised, Rick Grimes was written out of the series after an amazing final show, saying goodbye to fans after eight long years. Focusing on the events unfolding on-screen, most fans didn't realize there were some Easter eggs hidden in the episode, just waiting to be found. This includes the Evil Dead franchise's Necronomicon, also known as the "Book of the Dead," which fans were able to spot in Rick's last episode. The moment comes in the midst of a special cameo scene. Badly injured, Rick retreats to a run-down cabin, where he encounters a vision of deceased partner Shane Walsh, reprised by Jon Bernthal. The cabin itself carries a heavy resemblance to the one visited by Bruce Campbell's Ash and friends in the original Evil Dead movies from Sam Raimi. However, the Easter egg goes a bit further than that, as you can actually spot the Necronomicon laying near a pistol on the floor. It's covered in dust and easy to miss, but once the classic prop catches your eye, you won't be able to unsee it. The Evil Dead movies tell the story of Ash Williams unwittingly unleashing Hell after arriving at a dilapidated cabin. In the cellar, he locates the Necronomicon and an audio tape, which contains recordings of passages from the book. This summons demons who target Ash and company, killing everyone but the Bruce Campbell character in the first and second films. Ash would turn to the Necronomicon to head back home after time traveling to the past in the third movie, Army of Darkness. Of course, the dangerous book returned once again in the TV series continuation Ash vs. Evil Dead, which wrapped its third and final season earlier this year. It makes perfect sense for there to be an Evil Dead Easter egg in the show. Director Greg Nicotero has hidden several references to classic horror films throughout the series, including many he'd worked on personally. Nicotero had actually worked on the special effects for Evil Dead II, giving him a personal connection to the series. That particular sequel also had a scene where a deer's head on the wall began laughing hysterically at Ash. This deer head made its way into Rick's final Walking Dead episode as well, in addition to the Necronomicon. For better or for worse, it seems that Rick actually visited the Evil Dead cabin. 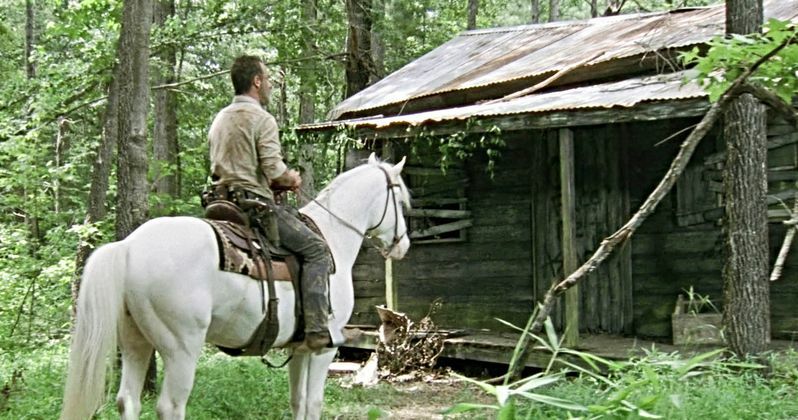 What's now definitely clear is that Rick Grimes is gone from The Walking Dead. A subsequent time jump skipped the story ahead six years, showing Rick doesn't find his way back home after the way he was written out. His story will continue over the course of three separate Walking Dead movies, however, meaning, Lincoln isn't done slaying zombies just yet. As it is, though, little Judith has become the last-surviving Grimes family member on the main series. Hopefully she doesn't meet the same fate as the rest of her family. The Necronomicon Easter egg was originally found by Halloween Love.